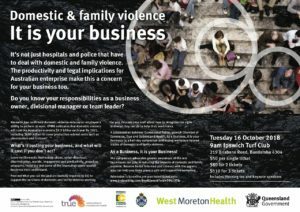 Domestic & family violence: it IS your business. It’s not just hospitals and police that have to deal with domestic and family violence. The productivity and legal implications for Australian enterprise make this a concern for your business too. Do you know your responsibilities as a business owner, divisional manager or team leader? Research has confirmed domestic violence reduces an employee’s ability to perform at work. KPMG estimates that domestic violence will cost the Australian economy $9.9 billion each year by 2021, including $609 million to cover production-related costs such as absenteeism and turnover. What’s it costing your business, and what will it cost if you don’t act? Leave entitlements, technology abuse, unfair dismissal, discrimination, morale, engagement and productivity, proactive programs… these are just some of the issues that every business must understand. Find out what you can do (and are lawfully required to do) to support the survivors of domestic and family violence working for you. Educate your staff about how to recognise the signs and what they can do to help their workmates. A collaboration between Queensland Police, Ipswich Chamber of Commerce, True and Queensland Health, As a Business, it is your Business! is a half-day symposium addressing workplace-related issues of domestic and family violence. The symposium advocates greater awareness of the role businesses can play in reducing the impacts of domestic and family violence. Become better informed and connect with the experts who can help you make yours a safe and supportive workplace. Includes morning tea and keynote speakers.